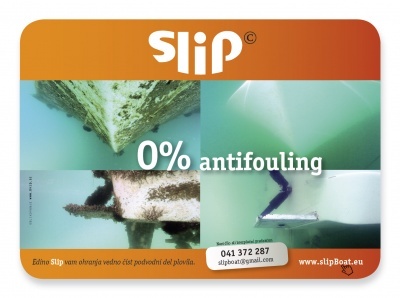 SLIP - ANTIK ROGAŠKA MIRAN ŽNIDAREC S.P. SLIP - EKOLOŠKA OBLEKA ZA VAŠE PLOVILO. REVOLUCIONARNA IN PATENTIRANA NOVOST! 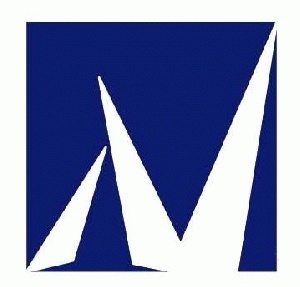 SLIP - LADIJSKI MOSTIČEK IZJEMNO LAHEK LADIJSKI MOSTIČEK SLIP IZDELALI SMO TAK MOSTIČEK, KOT GA ŽELIMO UPORABLJATI SAMI. 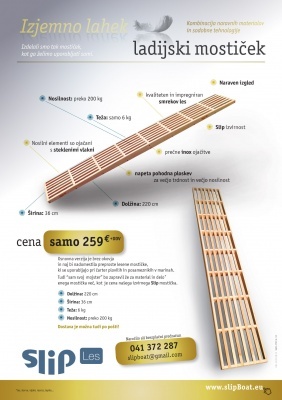 KOMBINACIJA NARAVNIH MATERIALOV IN SODOBNE TEHNOLOGIJE CENA: SAMO 259EUR + DDV, DOLŽINA: 220 CM, ŠIRINA: 36 CM TEŽA: SAMO 6 KG, NOSILNOST: PREKO 200 KG DOSTAVA JE MOŽNA TUDI PO POŠTI!